You can’t go wrong with this snorkeling duo. 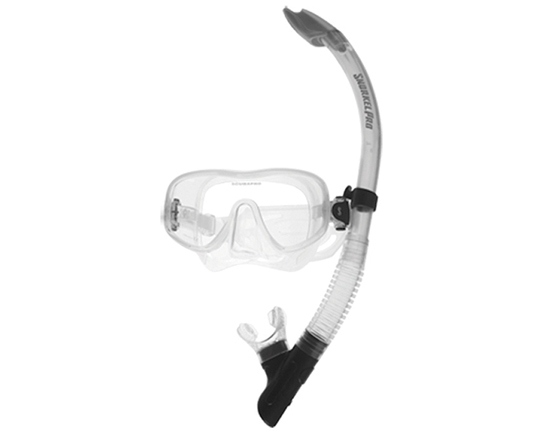 The frameless single lens TRINIDAD MASK offers an expansive view of the underwater world. Because the mask is low volume, clearing and equalizing is easy. A soft silicone skirt and quick-adjust strap create a comfortable fit. The TRINIDAD SNORKEL is an easy breather. It features a splashguard top to keep water out, a lower purge to expel any water that does manage to sneak in, and a premium silicone mouthpiece that fits comfortably in the mouth. The flex section and quick-connect clip make it easy to attach to the mask strap and even easier to use.